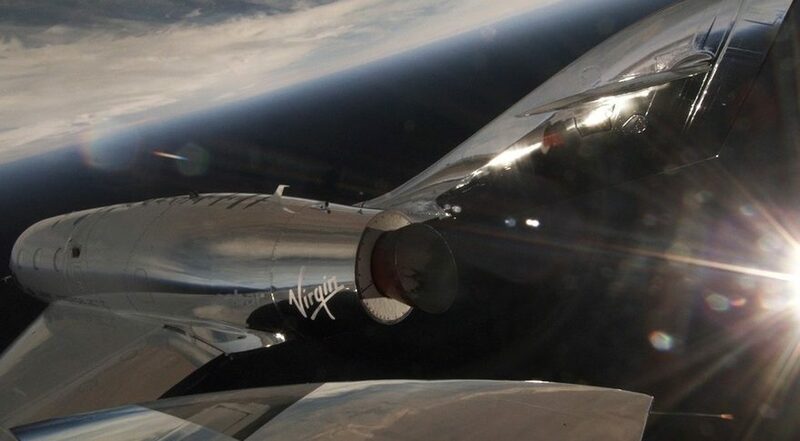 WASHINGTON — Virgin Galactic’s second SpaceShipTwo suborbital vehicle successfully performed its first powered flight April 5, the first such test flight since a fatal crash nearly three and a half years ago. The vehicle, named VSS Unity, was released from its WhiteKnightTwo carrier aircraft in the skies about 14,200 meters above Mojave, California, at approximately 12:00 p.m. Eastern time. The vehicle ignited its hybrid rocket motor on what the company said was a “partial duration burn” lasting 30 seconds. The vehicle reached a top speed of Mach 1.87 and altitude of 25,686 meters. After the end of its powered flight, SpaceShipTwo deployed its feathering system, raising its twin booms to permit a safe reentry before lowering them again for landing. The vehicle glided to a landing at the Mojave Air and Space Port in California a little more than 10 minutes after release. The flight was the first powered flight for VSS Unity, which the company rolled out more than two years ago. Virgin started a series of glide flights of VSS Unity in December 2016, with the most recent such flight on Jan. 11. Company officials at the time suggested that January glide flight would be the last before the start of powered test flights. This flight featured a longer burn, and thus higher speed and altitude, than prior powered test flights by the first SpaceShipTwo, VSS Enterprise. In a January 2014 test flight, VSS Enterprise reached a top speed of Mach 1.4 and altitude of more than 21,000 meters. That flight was the third powered test flight by VSS Enterprise. On the fourth, in October 2014, the vehicle broke apart seconds into the powered phase of flight, killing co-pilot Michael Alsbury and injuring pilot Peter Siebold. An investigation by the National Transportation Safety Board concluded Alsbury had prematurely unlocked SpaceShipTwo’s feathering mechanism as it passed through the sound barrier, causing an aerodynamic breakup. The investigation also blamed the vehicle’s developer, Scaled Composites, for design elements that contributed to the accident, including its inability to foresee a single-point failure such as a premature unlocking of the feathering mechanism. The Spaceship Company, originally a joint venture between Virgin and Scaled Composites but now wholly owned by Virgin, had already been building a second SpaceShipTwo at the time of the accident. Virgin leadership, including Sir Richard Branson, decided to continue development of that vehicle, which the company named VSS Unity at its February 2016 rollout. The company also built the rocket motor, using nitrous oxide and HTPB propellants. This powered test flight is the first in a series of such flights planned by the company to expand the vehicle’s performance envelope and to prepare for commercial flights carrying tourists and research payloads. The company has not stated how many such powered tests it expects to fly before the vehicle enters commercial service. In addition to the test program, Virgin announced a non-binding agreement in October with the Public Investment Fund (PIF) of Saudi Arabia whereby the PIF would invest $1 billion into Virgin’s space companies, which also include small launch vehicle developer Virgin Orbit. Virgin has not provided an update on the status of that investment. However, the company said that Saudi Crown Prince Mohammad bin Salman Al-Saud, whose duties include serving as chairman of PIF, visited the facilities of Virgin Galactic and The Spaceship Company in Mojave last weekend, while the company was preparing for what it only described as an “upcoming” SpaceShipTwo flight test. Photos of the event show the logo for the Saudi Arabian government’s “Vision 2030” initiative on the side of WhiteKnightTwo.